After taking the geocaching bracelet that I made on a little field test last weekend, I realized there were a few silly errors in the code I wrote for this gadget. One of the smaller and yet significant errors was a missing comma between the latitude and longitude coordinates of the cache we were looking for. As a result of this missing character, the bracelet was unable to recognize the correct location of the cache, and we couldn’t use the bracelet. Although we had the correct coordinates in a phone that had the official Geocaching app and were able to locate our cache with it, it was interesting to experience how a simple error in the code had a practical implication. Most (but not all) of the products I use every day have all/most of their bugs worked out before I start using them, so this isn’t a process that happens very often. It helped me appreciate the work that goes into designing the many gadgets I use from day-to-day, and the importance of fine details (like missing commas) in a way that DIY programming projects are certainly capable of. Where I seem to be stuck now is deciding where to go from here: do I continue working on the bracelet, or do I move on to another project? How could I make further improvements or add additional features? I’m sure I’ll find another project to keep me busy, but in any case, a few other minor errors in the code were identified, repaired, and the code on GitHub was updated. 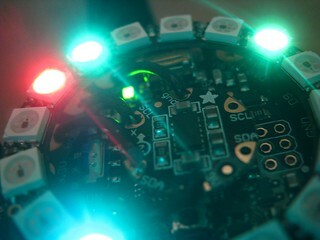 This entry was posted in Electronics, Hobbies and tagged adafruit, arduino, compass, DIY, electronics, geocaching, Georgia, navigation, programming. Bookmark the permalink.